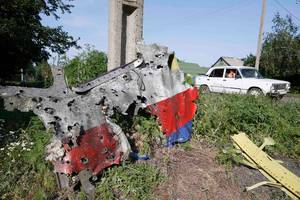 The tragedy of Malaysian MH 017 continues to elude any light of clarity being cast over it. The flight recorders are in England and are evaluated. What can come of it? Maybe more than you would assume. Especially the voice recorder will be interesting when you look at the picture of a cockpit fragment. As an expert in aviation I closely looked at the images of the wreckage that are circulating on the Internet. First, I was amazed at how few photos can be found from the wreckage with Google. All are in low resolution, except one: The fragment of the cockpit below the window on the pilots side. This image, however, is shocking. In Washington, you can now hear views expressed of a “potentially tragic error / accident” regarding MH 017. Given this particular cockpit image it does not surprise me at all. I recommend to click on the little picture to the left. You can download this photo as a PDF in good resolution. This is necessary, because that will allow you understand what I am describing here. 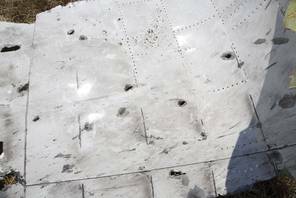 The facts speak clear and loud and are beyond the realm of speculation: The cockpit shows traces of shelling! You can see the entry and exit holes. The edge of a portion of the holes is bent inwards. These are the smaller holes, round and clean, showing the entry points most likely that of a 30 millimeter caliber projectile. The edge of the other, the larger and slightly frayed exit holes showing shreds of metal pointing produced by the same caliber projectiles. Moreover, it is evident that at these exit holes of the outer layer of the double aluminum reinforced structure are shredded or bent – outwardly! Furthermore, minor cuts can be seen, all bent outward, which indicate that shrapnel had forcefully exited through the outer skin from the inside of the cockpit. The open rivets are are also bent outward. In sifting through the available images one thing stands out: All wreckage of the sections behind the cockpit are largely intact, except for the fact that only fragments of the aircraft remained . Only the cockpit part shows these peculiar marks of destruction. This leaves the examiner with an important clue. This aircraft was not hit by a missile in the central portion. The destruction is limited to the cockpit area. Now you have to factor in that this part is constructed of specially reinforced material. This is on account of the nose of any aircraft having to withstand the impact of a large bird at high speeds. You can see in the photo, that in this area significantly stronger aluminum alloys were being installed than in the remainder of the outer skin of the fuselage. One remembers the crash of Pan Am over Lockerbie. It was a large segment of the cockpit that due to the special architecture survived the crash in one piece. In the case of flight MH 017 it becomes abundantly clear that there also an explosion took place inside the aircraft. So what could have happened? Russia recently published radar recordings, that confirm at least one Ukrainian SU 25 in close proximity to MH 017. This corresponds with the statement of the now missing Spanish controller ‘Carlos’ that has seen two Ukrainian fighter aircraft in the immediate vicinity of MH 017. If we now consider the armament of a typical SU 25 we learn this: It is equipped with a double-barreled 30-mm gun, type GSh-302 / AO-17A, equipped with: a 250 round magazine of anti-tank incendiary shells and splinter-explosive shells (dum-dum), arranged in alternating order. The cockpit of the MH 017 has evidently been fired at from both sides: the entry and exit holes are found on the same fragment of it’s cockpit segment! Now just consider what happens when a series of anti-tank incendiary shells and splinter-explosive shells hit the cockpit. These are after all designed to destroy a modern tank. The anti-tank incendiary shells partially traversed the cockpit and exited on the other side in a slightly deformed shape. (Aviation forensic experts could possibly find them on the ground presumably controlled by the Kiev Ukrainian military; the translator). After all, their impact is designed to penetrate the solid armor of a tank. Also, the splinter-explosive shells will, due to their numerous impacts too cause massive explosions inside the cockpit, since they are designed to do this. Given the rapid firing sequence of the GSh-302 cannon, it will cause a rapid succession of explosions within the cockpit area in a very short time. Remeber each of these is sufficient to destroy a tank. What “mistake” was actually being committed – and by whom? Because the interior of a commercial aircraft is a hermetically sealed pressurized chamber, the explosions will, in split second, increase the pressure inside the cabin to extreme levels or breaking point. An aircraft is not equipped for this, it will burst like a balloon. This explains a coherent scenario. The largely intact fragments of the rear sections broke in mid air at the weaker points of construction most likely under extreme internal air pressure. The images of the widely scattered field of debris and the brutally damaged segment of cockpit fit like hand in glove. Furthermore, a wing segment shows traces of a grazing shot, which in direct extension leads to the cockpit. 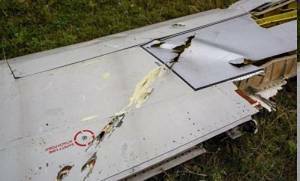 Interestingly, I found that both the high-resolution photo of the fragment of bullet riddled cockpit as well as the segment of grazed wing have in the meantime disappeared from Google Images. One can find virtually no more pictures of the wreckage, except the well known smoking ruins. If you listen to the voices from Washington now who speak of a “potentially tragic error / accident”, all that remains is the question of what might have been the nature of this “mistake” perpetrated here. I am not given to hover long in the realm of speculation, but would like to invite others to consider the following : The MH 017 looked similar in it’s tricolor design to that that of the Russian President’s plane. The plane with President Putin on board was at the same time ”near” Malaysia MH 017. In aviation circles “close” would be considered to be anywhere between 150 to 200 miles. Also, in this context we might consider the deposition of Ms. Tymoshenko, who wanted to shoot President Putin with a Kalashnikov. But that this remains pure speculation. 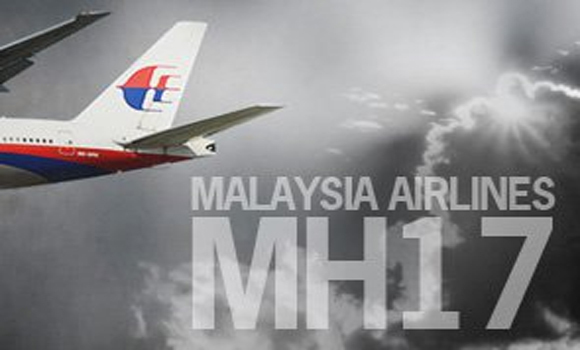 The shelling of the cockpit of air Malaysia MH 017, however, is definitely not speculation.